This is the reason why I eat butter instead of margarine: Butter is the real thing. Learn the difference between butter and margarine and find out why you should choose to eat real butter always. 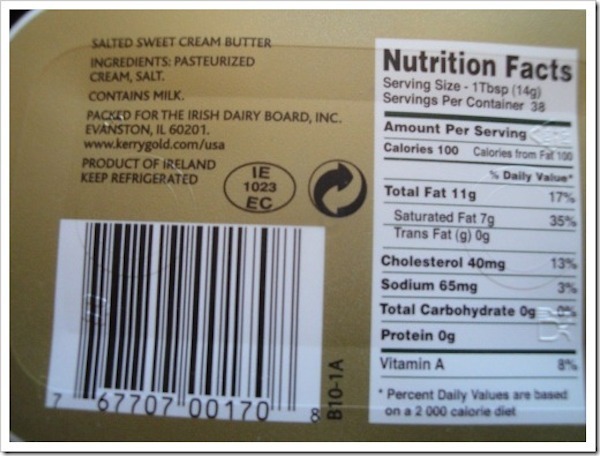 When you are in the dairy aisle in the supermarket, how often do you see a butter product being marketed as healthy? Almost never. It’s always the margarine alternative that boasts of health benefits, but in reality is butter the one that is good for your health. Margarine is a completely different story. The substance that creates margarine is nothing more than a scientific process, which created something that has proven to be incredibly bad for our bodies: trans fats. Just look at the laundry list of ingredients. Margarine was created as a cheaper alternative to butter and started being mass produced in 1903 when it was found that adding hydrogen to vegetable oil turns it into a more solid, spreadable product. Margarine was much cheaper to produce than butter and so it became very popular. In recent years, studies have shown that trans fats can have really bad effects on our health. It is important to stay informed so that we can make the best decisions for our families. Fatty acids like omega 3 and 6 are really important fats for our brain function. Vitamins A, D and E and all fat-soluble vitamins that help transport fat around the body. So natural fats are good. Real butter contains all of them! Trans fats act differently, their molecular structure is different, and so they provide no help to the body in the way natural fats do. One study (Dalainas & Ioannou, 2008) showed a 23% increase in coronary artery disease in just a 2% increase in energy taken from trans fats. Butter is full of immune-boosting vitamins. It contains Lauric Acid (also found in breast milk and coconut oil). 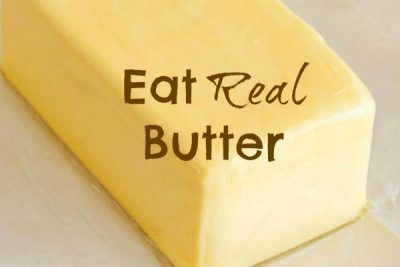 Real butter is a great source of healthy cholesterol, fatty acids, antioxidants, and also helps with nutrient absorption. Butter Contains a Lot of Healthy Saturated Fats. The “war” against saturated fat was based on bad science. It was never really proven that it caused any harm. In fact, recent studies suggest that there is no association at all between saturated fat and cardiovascular disease. The fat found in simple carbohydrates like bread and sugar is actually what is to blame for heart disease. This is the reason why I eat butter instead of margarine. Butter is a completely natural food essential to your health. Make sure you buy an organic butter from grass-fed cows. Good natural fats are good for you. Having higher levels of cholesterol is also no longer thought to be as bad for you, and slightly higher levels of cholesterol in women have been actually linked to a longer life. SOURCE. So, the next time you think you are doing your body good by choosing a low fat butter alternative, think again and go for the real thing instead.